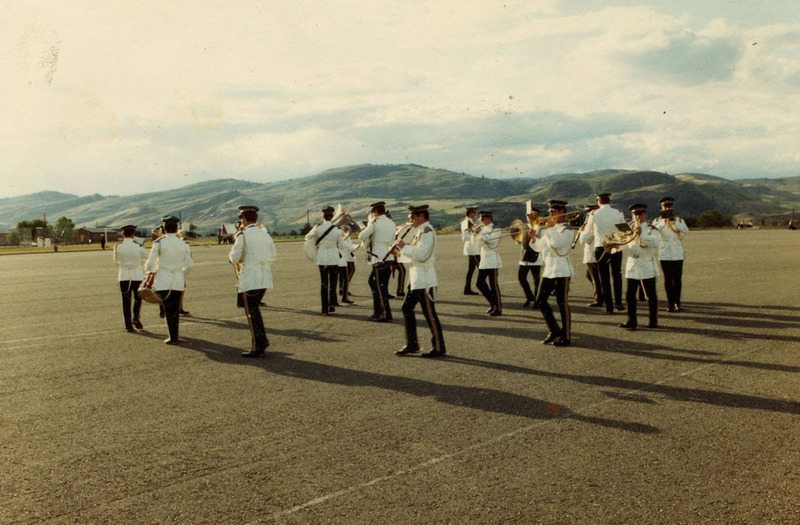 I stumbled across some photos of the band from the History of the Vernon, Army Cadet, website. 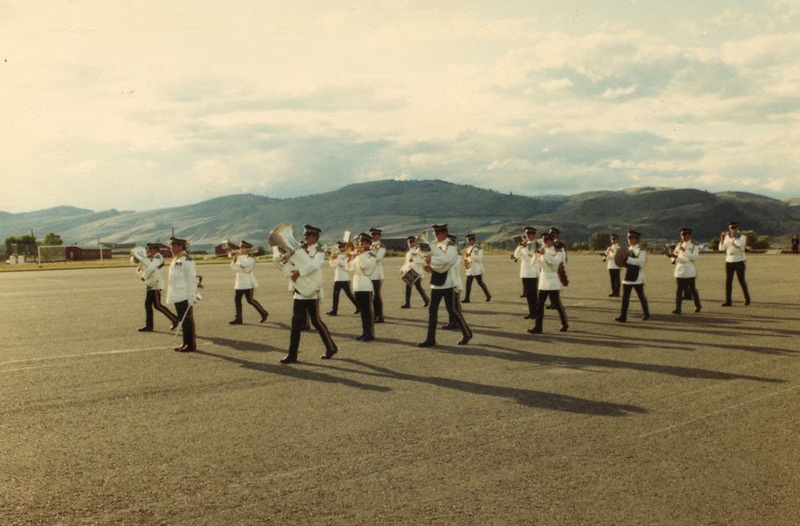 The band stayed in Vernon, British Columbia, Canada, for approximately a week, in the summer of 1984. 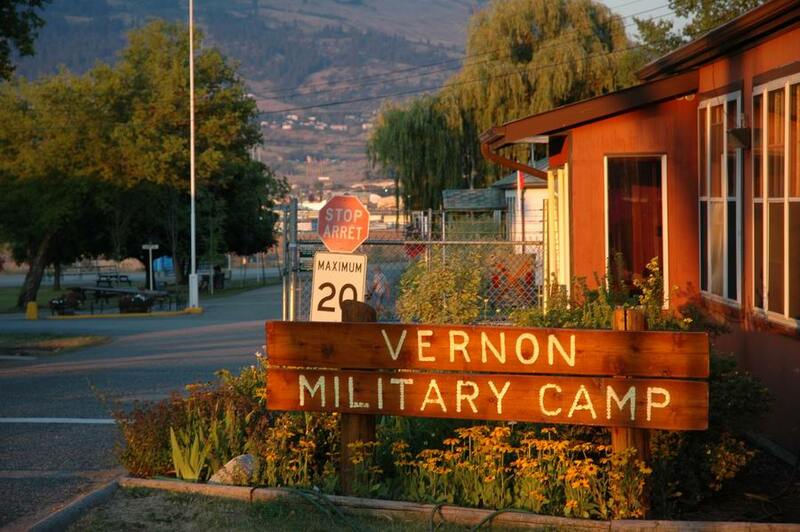 I’ve since discovered Camp Vernon, where we were barracked, has been one of the most important Canadian, Army Cadet Summer Training Centres (ACSTC) since 1949. I don’t remember too much about our official engagements but vividly remember off duty time because it was predominantly spent lounging around the shore of Lake Okanagan. Some 50 kilometers separate Vernon from the town of Kelowna, both situated on the lake and the area is probably the most spectacular I have ever experienced. The sky was big and blue, the rolling foothills of the Rockies surrounded us, the air was fresh and clean and the lake, enormous, was edged with yellow sand. It was truly idyllic! 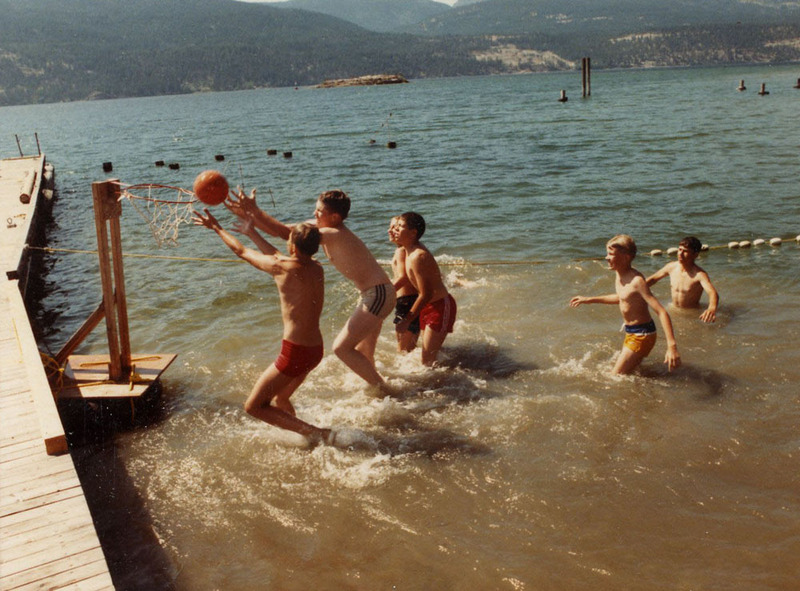 At some point we took part in a parade in Camp Vernon and we also played in the Kelowna Regatta. 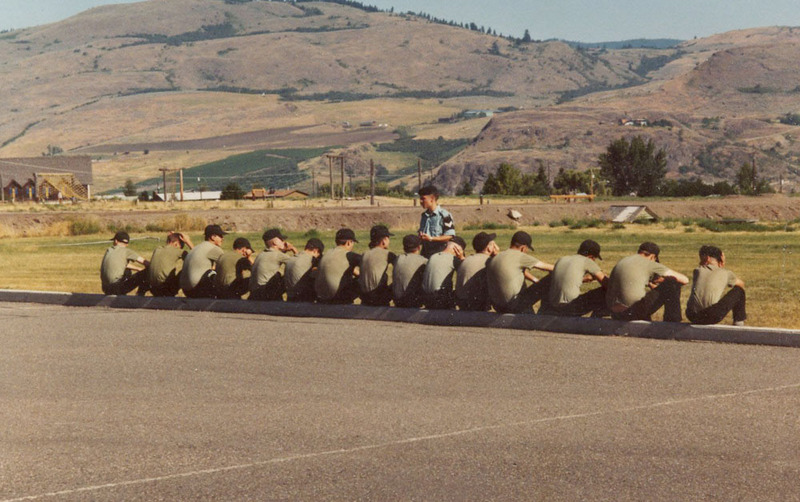 I remember mornings spent lazing under shady trees in a nearby park and a radio interview I took part in with Mick Henderson, for Okanagan Radio. I distinctly remember the interview, in the back of a mobile radio van on the edge of Lake Okanagan, because I made some reference to the crappy piccolo I was having to play. It really did have an elastic band on it to force a key to work and the plating had all worn off. It was a total relic, badly out of tune, leaky and a couple of keys, certainly the f sharp key, didn’t work. Shortly after our return to Osnabruck, Mick decided to buy me a new one. 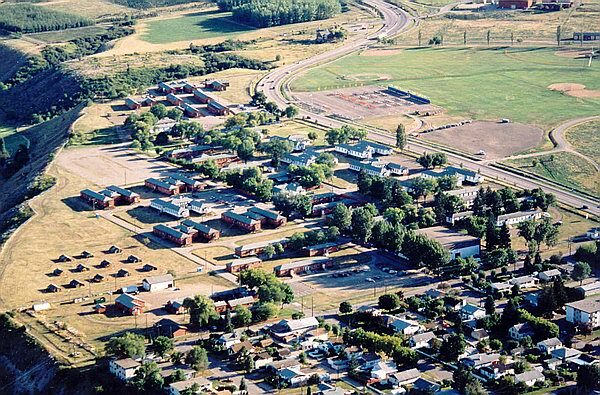 I remember our barracks, large, wooden billets and I think we shared rooms with some of the cadets but I think NCO’s had their own rooms. The SNCO’s were probably in the mess. It was a busy camp and the mess hall had to operate shifts to feed the hundreds of cadets but the food was good. 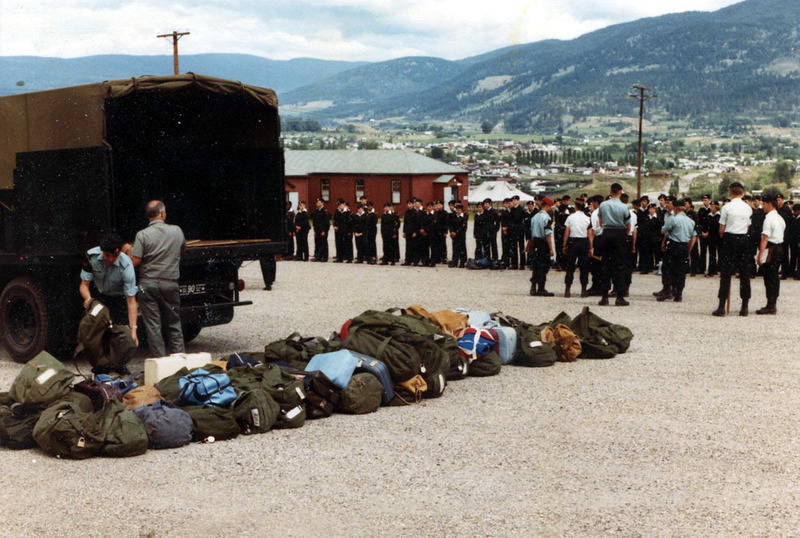 The ‘parade’ square was enormous and both on it and around the edges were cadres of students practicing drill, often with a chant, being shouted across an adjacent assault course or learning various other field skills. On parade, we wore ‘whites’ with flat caps rather than helmets and I remember they couldn’t get me a jacket my size so I had to wear a chef’s jacket that wasn’t quite long enough and had a slightly strange collar. Martin Doughy dubbed me the ‘Barbecue Major’ ( I was a corporal at the time). I think we went to Vernon because of some connection with Fort Garry Horse though they are based in Winnipeg. However, I am not sure! I discovered the photos: here. © 努江虎 – 노강호 2014 Creative Commons Licence.